A cat’s life is good! Once the weather became milder and snow-free, Hemingway was keen to get roaming in our yards. I’d hazard a guess that it partly reminds her of her early kittenhood days, when she’d roam around with her siblings before we adopted her. So, these days she wants out…..comes in for brief respites and some munchies….and then out she goes again. I always enjoy watching her…even when she’s just there resting and taking it all in. Her ears are always on alert. In the first photo, her ears are turned back; she’s heard something of interest. And in her reclining position (in these two photos), she enjoys watching birds flying overhead or just critters moving about. I just love looking at her pretty, shaggy, and soft coat. And how she is always at peace and so calm. Always totally comfortable. The bright light brings out the green. Whoosh! Splonch! It’s empty no more! If it isn’t a box, well then it’s a paper bag…..that traps cats. Our cat had been curled up on the bed for a short spell, and then she hopped down to go exploring. As she moved quietly, I didn’t hear where she had gone, so it wasn’t until I passed by the bathroom a little later and glanced towards the window that I saw her perched in one of her favourite places. 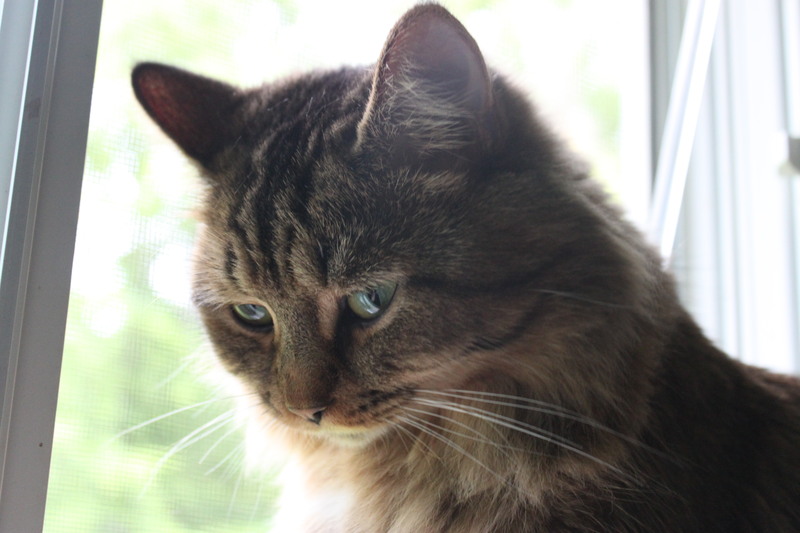 So….yep, I scooted back to my room and returned camera in hand for some serene – with back lighting – cat poses. She was in a cooperative mood. Hahaha! 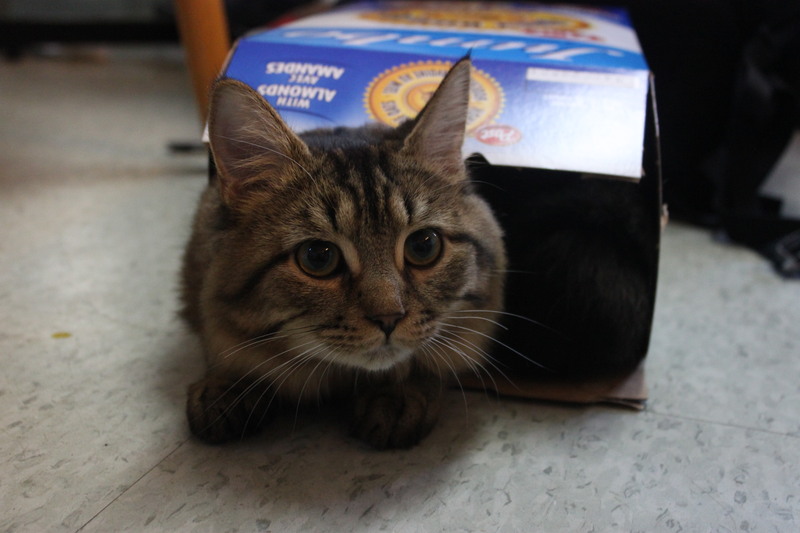 In an earlier post – a haiku poem – I added in a picture of our cat’s eyes peeking from inside an empty beer case. 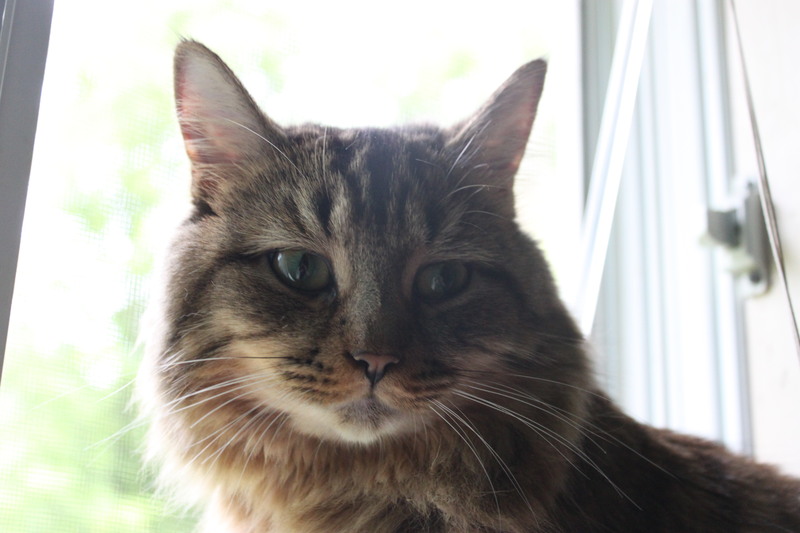 In these photos you get to see a bit more of our Hemingway. She isn’t always tucked inside boxes, but she DOES have a weakness for them….or maybe it’s a penchant? Just about any box will do as a cat trap, because they are just too darn irresistible! 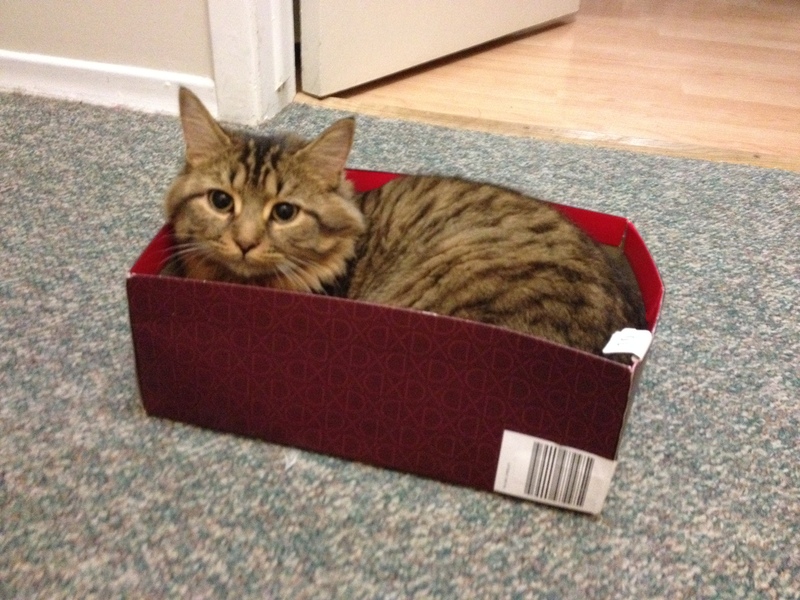 She claimed that red shoe box for her own cuddle spot, as soon as she laid eyes on it. And she planted herself into it and curled up all sorts of wonderful ways for some time, before it finally broke at the cardboard seams. The other one was a short-lived cereal box adventure – one of those quick love-it-and-leave-it kind of adventure. Now, the other day – for which I have no photo because it happened so fast – when I playfully tossed her favourite ping-pong ball into a slightly-larger-than-cat-size, see-through plastic bin standing on the floor in the hall, she charged in her usual chase-that-ping-pong-ball fashion and with full momentum dove head first into that plastic bin! When I peeked over to see if she was all right, her head popped up and looked at me with that self-assured, I-have-everything-under-control feline look. I smiled. And well, I also mentally gave her a “10” for that smoothly executed acrobatic somersault display!